Several shows hadn’t aired since November 14. ABC: THE GOLDBERGS (1.2) and MODERN FAMILY (1.3) were steady, but AMERICAN HOUSEWIFE (0.9), SINGLE PARENTS (0.8) and A MILLION LITTLE THINGS (0.7) fell 0.1 from last week. CBS: SURVIVOR was down 0.1 from last week’s 2 hour episode to 1.5. Airing for the first time since November 14, SEAL TEAM (0.8) and CRIMINAL MINDS (0.7) were steady. 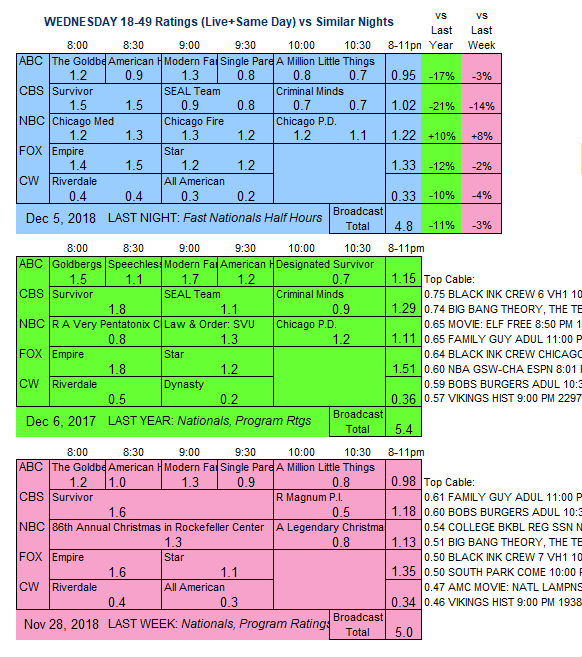 NBC: Also back with new episodes from November 14, CHICAGO MED held at 1.2, while CHICAGO FIRE lost 0.1 to 1.2, and CHICAGO PD was up 0.1 to 1.1. FOX: On midseason finale night, EMPIRE dropped 0.1 to 1.5, while STAR gained 0.1 to 1.2. 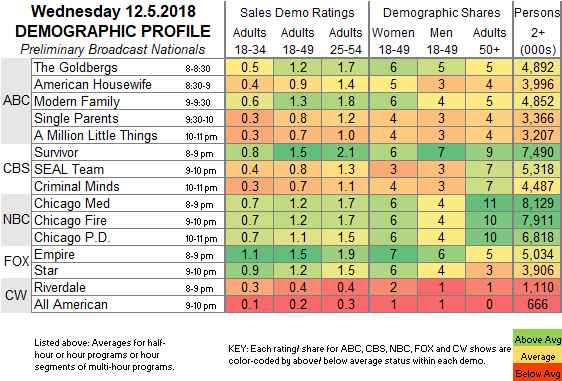 CW: RIVERDALE stayed at 0.4, but ALL AMERICAN lost 0.1 to 0.2. THE GREAT AMERICAN BAKING SHOW returns to ABC tonight, preceded by A CHARLIE BROWN CHRISTMAS.